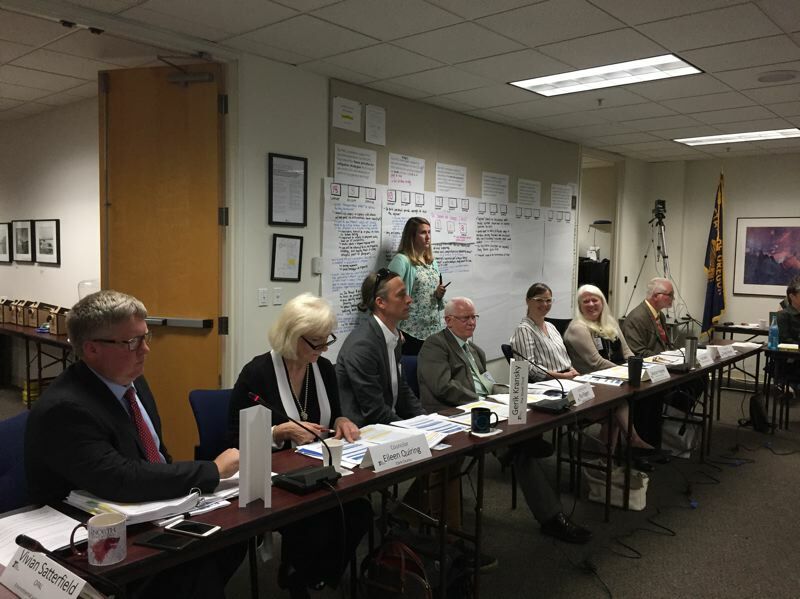 A tolling policy advisory committee's draft recommendation would toll all lanes of Interstate 5 in Portland and the Abernethy Bridge on Interstate 205 to test efficacy for a larger tolling network. PORTLAND — A state policy advisory committee plans to recommend tolling all lanes of Interstate 5 in Portland and the Abernethy Bridge on Interstate 205 as a strategy to reduce traffic congestion and raise revenue to add a third lane on the two-lane stretches of I-205. Tolls on I-5 would extend from Northeast Going/Alberta Street to Southwest Multnomah Boulevard and vary depending on time of day and levels of congestion. "What congestion pricing does … is it actually reduces the number of people on the road during peak period travel, gets the through traffic that we're looking for, that we thought we needed with increased road space, but we actually get it with the pricing," said committee member Chris Hagerbaumer of the Oregon Environmental Council. "…This is the cheapest way to get new 'capacity.'" The tolls would be launched as a pilot program to prove to the public the efficacy of congestion-priced tolls in reducing traffic congestion. The second part of the recommendation calls for analyzing the results of the tolls and possibly developing a subsequent, comprehensive plan for tolling other highways in the Portland area. Several committee members asked that increased transit services be a condition of imposing any tolls to help mitigate the impact the tolls could take on low-income commuters. "It's hard to price people for something when we cannot provide them with other options," said committee member Craig Dirksen of the Metro Council. "We need to include transit access from the very beginning." The 25 members of the committee failed to reach consensus on every aspect of the plan they'll recommend. Each has an opportunity to write an explanation for their support or opposition of the plan in the final draft of the recommendation. Representatives for environmental and trucking interests clashed over whether the pilot should include raising revenue to build another lane on I-205 from Highway 99 East to Stafford Road. Environmental representatives want to encourage transit, carpooling and other alternative modes of transportation to decrease demand on the roadways rather than increase space for more vehicles. Jana Jarvis of the Oregon Trucking Association said she would support a plan only if it included raising revenue for additional lanes. "Congestion" or "value pricing" refers to the practice of changing the toll price for a freeway or a lane based on how much congestion is on the roadway during that time. During the rush-hour periods, the price would be higher, and at some times at night, there might be no cost to use the same road. A $5.3 billion transportation-funding bill passed last year requires the Oregon Transportation Commission to consider tolling in the Portland metro area but does not mandate it. A final version of the recommendation is scheduled to be presented to the transportation commissioners at their July 12 meeting. They have until December to send a proposal to the Federal Highway Administration, which would need to approve any plan. It would take several years to implement the tolling scheme, according to state transportation officials.